identity for the past hundred years -- John Wayne with a little bit of Sam Houston and Davy Crockett all rolled into one, with a great singing voice and an ear for music added on. He defined country music for two generations of listeners, cowboy songs for much of the 20th century, and American music for much of the world. He was country music's first genuine "multimedia" star, the best-known country & western singer on records, in movies, on radio, and on television from the early '30s until the mid-'50s. His 300 songs cut between 1929 and 1964 include nine gold record awards and one platinum record; his 93 movies saved one big chunk of the movie industry, delighted millions, and made millionaires of several producers (as well as Autry himself); his radio and television shows were even more popular and successful; and a number of his songs outside of the country & western field have become American pop culture touchstones. 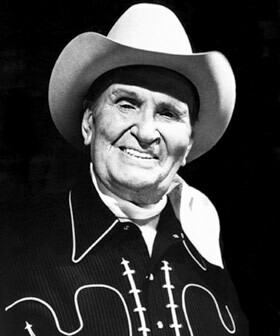 The biggest selling country & western singer of the middle of the 20th century was born Orvon Gene Autry on September 29, 1907, in the tiny Texas town of Tioga, the son of Delbert and Elnora Ozmont Autry. He was first taught to sing at age five by his grandfather, William T. Autry, a Baptist preacher and descendant of some of the earliest settlers in Texas, contemporaries of the Houstons and the Crocketts (an Autry had died at the Alamo). The boy's interest in music was encouraged by his mother, who taught him hymns and folk songs and read psalms to him at night. Autry got his first guitar at age 12, bought from the Sears, Roebuck & Co. catalog for eight dollars (saved from his work as a hired hand on his uncle's farm baling and stacking hay). By the time he was 15, he had played anyplace there was to perform in Tioga, including school plays and the local cafe, but made most of his living working for the railroad as an apprentice at $35 a month. Later on, as a proper telegraph operator, he was making $150 a month, which those days was a comfortable income in that part of Texas. He was working the four-to-midnight shift at the local telegraph office in Chelsea, OK, one summer night in 1927 when, to break up the monotony, he began strumming a guitar and singing quietly to himself. A customer came into the office; rather than insisting upon immediate service, he motioned for Autry to continue singing, then sat down to watch and listen while he looked over the pages he was preparing to send. At one point, the visitor asked him to sing another. Finally, after dropping his copy on the counter, the customer told Autry that with some hard work, he might have a future on the radio, and should consider going to New York to pursue a singing career. The man, whom Autry had recognized instantly, was Will Rogers, the humorist, writer, and movie actor, and one of the most popular figures in the entertainment world of that era. Autry didn't immediately give up his job, but just over a year later he was in New York auditioning for a representative of RCA Victor. The judgment was that he had a good voice, but should stay away from pop hits, find his own kind of songs and his own sound, and get some experience. He was back six months later, on October 9, 1929, cutting his first record, "My Dreaming of You"/"My Alabama Home," for Victor. Two weeks later, Autry was making a demo record for the Columbia label of Jimmie Rodgers' "Blue Yodel No. 5." Present that same day in the studio were two up-and-coming singers, Rudy Vallйe and Kate Smith. Autry found himself being pressured to sign an exclusive contract with Victor, but chose instead to sign with the American Record Corporation. Their general manager, Arthur Sattherly (who would later record Leadbelly, among many other acts), persuaded Autry that while Victor was a large company and could offer more money and a better marketing apparatus, he would be lost at Victor amid its existing stable of stars, whereas ARC would treat him as their most important star. Additionally, Sattherly -- through a series of arrangements involving major retail and chain stores across the country -- now had the means to get Autry's records into peoples' hands as easily as Victor. His first recordings had just been released when his mother, who'd been ill for months, died at the age of 45, apparently of cancer. Autry's father began drifting away soon afterward, and he became the head of the family and the main supporter of himself, two sisters, and a younger brother. In early December of 1929, Autry cut his first six sides for ARC. The music was a mix of hillbilly, blues, country, yodel songs, and cowboy ballads. His breakthrough record, "That Silver-Haired Daddy of Mine," co-written by Autry and his friend Jimmy Long one night at the railroad depot, was released in 1931. The song sold 30,000 copies within a month, and by the end of a year 500,000 had been sold, an occasion that American Records decided to mark with the public presentation of a gold-plated copy of the record. Autry received a second gold record when sales later broke one million. And that was where the notion of the Gold Record Award was born. The record also led him into a new career on the radio as Oklahoma's Yodeling Cowboy on the National Barn Dance show sponsored by WLS out of Chicago. It was there that Autry became a major national star -- his record sales rose assisted by his exposure on radio. During the early years of his career, Autry took a number of important collaborators and musicians aboard. Among them were Fred Rose, the songwriter (later responsible for "Your Cheatin' Heart") with whom he collaborated on many of his hits, and fiddle player Carl Cotner (who also played sax, clarinet, and piano), who became his arranger. Autry had a knack for knowing a good song when he heard it (though he almost passed on the biggest hit of his career), and for knowing when a song needed something extra in its arrangement, but it was Cotner who was able to translate his sensibilities into musical notes and arrangements. Mary Ford, later of Les Paul fame, was in Autry's band at one time, and in 1936 Autry signed up a 17-year-old guitar player named Merle Travis, the future country star and songwriter. By the early '30s, Autry became one of the most beloved singers in country & western music. By 1933, he was getting fan letters by the hundreds every week, and his record sales were only going up. Autry's career might've been made right there, but fate intervened again that year, in the form of the movie business. The Western -- especially the B Western, the bottom-of-the-bill, low-budget action oater -- had been hit very hard by the coming of sound in the years 1927 to 1929. Audiences expected dialogue in their movies, and most Western stars up to that time were a lot better at riding, roping, and shooting than reading lines. Not only did producers and directors need something to fill up the soundtracks of their movies, especially on the limited budgets of the B Westerns, but something to substitute for violent action, which was being increasingly criticized by citizen groups. 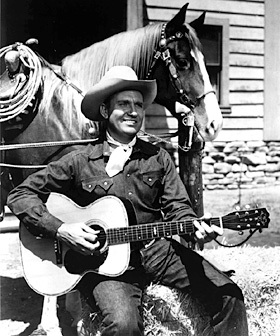 Cowboy star Ken Maynard, who was a great trick rider and stuntman but no singer, had tried singing songs in a few of his movies, and the producers noticed that the songs had gone over well despite his vocal limitations. Maynard was making another Western, In Old Santa Fe (1934), for Mascot Pictures, and producer Nat Levine decided to try an experiment, putting in a musical number sung by a professional. By sheer chance, the American Record Company and Mascot Pictures were locked together financially, though indirectly, and with the help from the president of ARC, Levine was steered toward Autry. A phone call brought the young singer and another ARC performer -- multi-instrumentalist/comedian Smiley Burnette -- out to Hollywood, where, after a quick meeting and screen test, the two were put into In Old Santa Fe. Autry had only one scene, singing a song and calling a square dance, but that scene proved to be one of the most popular parts of the movie. Levine next stuck Autry and Burnette into a Ken Maynard serial, Mystery Mountain, in minor supporting roles. But Autry's next appearance was much more important, as the star of the highly successful 12-chapter serial The Phantom Empire. 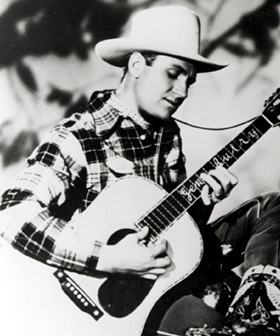 Perhaps recognizing that Autry was no "actor," and that he had an audience of millions already, he, the writers, and the producer agreed that he should simply play "Gene Autry," a good-natured radio singer and sometime cowboy. The success of Autry's early films was not enough to save Mascot Pictures, which collapsed under the weight of debts held by Consolidated Film Laboratories, which did Mascot's film processing. In 1935, Consolidated forced a merger of Mascot and a handful of other small studios and formed Republic Pictures, with Consolidated's president, Herbert J. Yates, at the helm. Republic thrived in the B movie market, ultimately dominating the entire field for the next 20 years. And central to Republic's success were the Westerns of Gene Autry. His first starring Western for the newly organized Republic Pictures, Tumbling Tumbleweeds (released on September 5, 1935), which also included the singing group the Sons of the Pioneers, was a huge hit, and was followed by Melody Trail, The Sagebrush Troubador, and The Singing Vagabond, all released during the final three months of 1935. Autry settled into a schedule of one movie every six weeks, or eight per year, at $5,000 per movie, and a formula was quickly established. The production values on these movies were modest, in keeping with their low budgets and tight shooting schedules, but within the framework of B Westerns and the context of their music, they were first-rate productions. By 1937 and for five years after -- a string that was only broken when he enlisted in the army during World War II -- Autry was rated in an industry survey of theater owners as one of the top ten box-office attractions in the country, alongside the likes of James Cagney and Clark Gable. 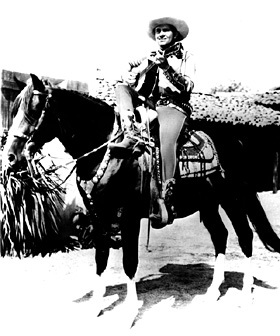 Autry was the only cowboy star to make the list, and the only actor from B movies on the list. For Republic Pictures, his movies were such a cash cow, and so popular in the southern, border, and western states, that the tiny studio was able to use them as a way to force "block booking" on theater owners and chains -- that is, theaters only got access to the Autry movies scheduled each season if they bought all of Republic's titles for that season. It was Autry's discovery of this policy (which, in fairness, was practiced by every major studio at the time, and led to the anti-trust suit by the government that ultimately forced the studios to give up their theater chains) in early 1938 that led to his first break with Republic. The problems had been brewing for some time, over Autry's unhappiness at never having gotten a raise from his original Mascot-era $5,000-per-movie deal, and contractual clauses -- which had never been exercised, but worried him nonetheless -- giving Republic a share of his radio, personal appearance, and endorsement earnings. After trying unsuccessfully to work out the problems with Yates, Autry walked out of the studio chief's office and thereafter refused to report for the first day's shooting on a movie called Washington Cowboy, later retitled Under Western Stars when it became the debut of Roy Rogers. After eight months of legal sparring, Autry was left enjoined from making live appearances. Republic, however, found itself with an uprising of theater owners and chains on its hands -- without a guarantee that it would have any Autry movies to release, the studio's entire annual distribution plans were jeopardized. By the fall of 1938 the two sides had come to terms, with raises for Autry and freedom from the most onerous clauses in his old contract. Despite his best efforts, however, he couldn't help the theater owners over the block-booking policy, for it was now entrenched in the industry and an integral part of Republic's business plan. Meanwhile, his recording career continued, often in tandem with the movies. Whenever Republic could, the studio licensed the rights to whatever hit song Autry had most recently recorded to use it as the title of his newest picture -- when this was done, Republic always charged the theater owners somewhat more for the film, and they paid it, because the song had "pre-sold" the movie to the public. The songs kept coming, sometimes out of the movies themselves, and not always his own: Autry's friend Ray Whitley had written "Back in the Saddle Again" for a 1938 George O'Brien Western called Border G-Man, and when Autry was looking for a theme song for his own radio show, he went back to Whitley's song, made a few changes, and recorded it himself. Along with "That Silver-Haired Daddy of Mine," it was the song he would be most closely associated with. 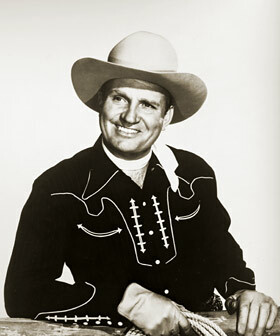 Autry's career was interrupted by his service in the military during World War II, but when he returned to the recording and movie studios in 1945, he resumed both his singing and film careers without skipping a beat. He was still a name to be reckoned with at the box office, although he was never again ranked among the top ten money-making stars of movies. The cultural dislocations caused by World War II and their effect on rural and small-town America and on the movie business, as well as the impending arrival of television, had shrunk the B movie market to a shadow of its 1930s glory. His movies still made money, however, and he kept making them right into the beginning of the 1950s, after which he moved into television production -- Autry had already begun buying up radio stations before the war, and by the early '50s he was owner of several television stations, a studio, and his own production company, where he made his own television program as well as others that he owned. His singing career was bigger than ever, however. Even before the war, Autry had occasionally moved away from country music and scored big, as with his 1940 hit version of "Blueberry Hill," which predated Fats Domino's recording by 16 years. After the war, he still did cowboy and country songs such as "Silver Spurs" and "Sioux City Sue," sprinkled with occasional folk songs and pop numbers. 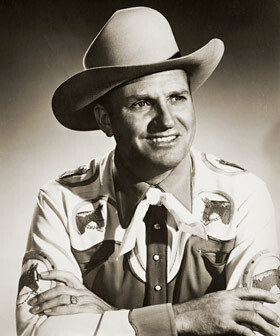 In 1949, however, Autry scored the biggest single hit of his career -- and possibly the second- or third-biggest hit song ever recorded up to that time -- with "Rudolph the Red-Nosed Reindeer," a song by Johnny Marks that Autry had recorded only reluctantly, in a single take at the end of a session. That same year, he cut "(Ghost) Riders in the Sky," a number by a former forest ranger named Stan Jones, which became both a country and pop music standard, cut by everyone from Vaughan Monroe to Johnny Cash. By the mid-'50s, Autry's career had slowed. Rock & roll and R&B were attracting younger listeners, and a new generation of country music stars, heralded by Johnny Cash and Marty Robbins, was beginning to attract serious sales. Autry, then in his forties, still had his audience, but he gradually receded from the limelight to attend to his burgeoning business interests. He died October 2, 1998.